The Newest Drill Technology in Two Decades! Some have already referred to the Sunflower 9800 Single Disc Drill as a “speed drill” due to its unique ability to seed at a higher speeds without creating uneven seed rows. However, you may just want to call it “extremely versatile.” Whether you run it fast or slow; in no-till, minimum-till or conventional till; flat ground or on a slope, the Sunflower 9800 works well in all conditions. Hydraulic down pressure on the openers, which is adjustable on the go from the tractor cab, eliminates the need to adjust springs or individual row openers. Thanks to the 9800 Single Disc Drill’s patented design, we’ve also eliminated the need for a gauge wheel running next to the disc. This allows the “opposing single discs” to lift and displace the soil between the two narrow 6” rows. The loosened soil coming off of the twin discs, flows back against the trailing packer wheels, which re-level and firm the soil over the seed rows. This soil displacement process eliminates sidewall compaction, hair pinning and open seed furrows, while leaving a 6” blackened strip to encourage soil warming. Available in seeding widths from 30’ to 60’, the 9800 is the one air drill that will provide maximum productivity in any environment. Extra Heavy Frames: The 6 X 8 x 1/2-inch wall tubing at the front and rear of main frames and 1/2-inch wall tubing throughout. Seed Tube Removal: Taking off seed tubes for clearing debris or improved access of the disk only requires removal or a spring pin. The tube then simply lifts up and out of the opener assembly. Undercarriage: All main frames and large wings use a dual walking tandem axle design. 3-inch walk beam pivots and spindles ensure adequate strength. Small wings use single wheels with the same 3-inch spindle for commonality of parts. 20 ply tires are used on the main frame to match the weight of the drill. Lift Assist Rear Hitch: Weight is automatically transferred to the lift assist hitch and tractor drawbar during wing up, by an accumulator system on the drill. Used on the larger drills, the lift assist hitch allows drills from 30 ft to 50 foot with no reconfiguration of the main frame undercarriage. Down Pressure Cylinders: Down pressure of each of the tool bars on the 9800 drill is loaded by hydraulic cylinders connected in a parallel circuit. Down pressure is uniform across the drill and through the entire range of motion of the tool bars. This is a marked improvement over springs that increase down pressure when stretched or compressed depending on configuration. Down Pressure Control Box: The row unit down pressure is controlled by the operator on the go. The current down pressure is displayed at the top of the control box shown at the right. Increasing and decreasing down pressure across the drill is as simple as turning the knob below the screen. Down pressure can be set from carrying none to all of the drill weight on the toolbars. Bulkhead: The bulkhead at the rear of the drill has the connections for the air system neatly arranged and labeled for operator convenience. Keeping all of the connections above the hitch point keeps them out of harm’s way. Tool Bar Lock Up: The operator can lock up the tool bars with a simple twist of the spring loaded handle (lower detail circle). This is desirable for working on the row units or for locking up the main frame units in transport. When released the rod engages the tab of the frame (upper detail circle). The lock up rod is robust enough to hold even if the tractor hydraulics are engaged to lower the units. 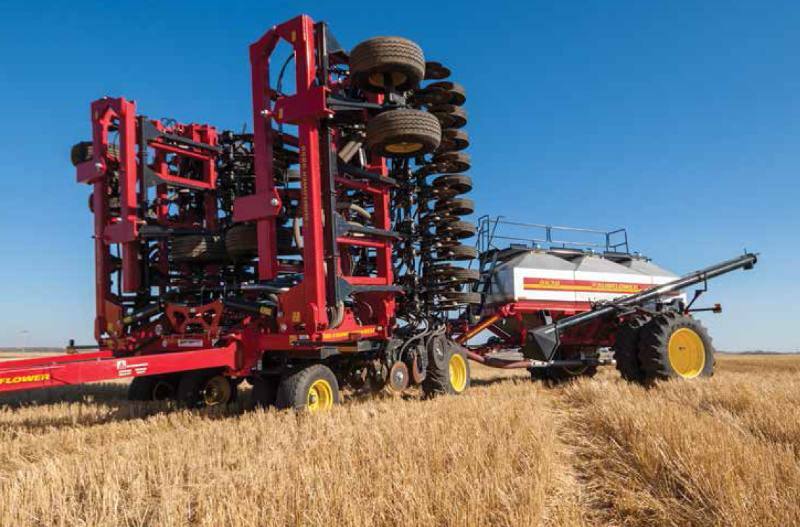 Row Units: Each 30-inch wide tool bar on the 9800 single disc drill consists of two pairs of seeding disks and two packer tires. Additionally the tool bar can be configured with optional mid row nutrient placement disc openers (A). Each pair of seeding disks are mounted horizontally opposed on a common strut. With all of the openers in a single row, the opener spacing stays uniform in turns and when drifting on side slopes. The amount of soil coverage over each seed row is more uniform with this arrangement because there are no back rows to cover front rows. With all of the displaced soil thrown between the disc and in front of the packer tire, more loose soil is created for packing and less open furrows are created than with competitive single disc designs. With the seed placed precisely at each edge of the packer tire, crusting is virtually eliminated as the seedling has an unpacked path to the surface. The 5 degree scrub on the packer tires compacts the soil and keeps the tires cleaner in sticky conditions. Optional holes in the mounts allow the operator to run the tires straight if desired. Optional mid row placement disc (A) place desired nutrition (NH3, dry, liquid or combination) between and below the seed rows. Tool Bar Connecting Point: The row units on the 9800 drill are connected with four bolts at the rear of the frame. Adding the mid row fertilizer units is as easy as unbolting the joint and installing the fertilizer assembly (shown) with longer bolts. Row units can also be easily removed for more intensive maintenance. Hooks on the tool bar and fertilizer assemblies assist in assembly. Depth Control Collars: Depth control collars on each of the frame lift cylinders give a visual confirmation that each of the cylinders is at the correct depth. Utilizing the same combination of collars on each cylinder assures seeding depth will be uniform and warns the operator of improper operation if the cylinder does not collapse to the collars. Depth changes require only minutes and is done at the lift cylinders. No changes at the seed openers are required. Depth Control Progression Chart: A decal on the drill frame displays the progression of the depth collars so the operator does not have to guess or get out the tape measure to make small changes in depth. Simply by finding the pattern of the stops he has in the cylinder, he can look to the next block to the left or right to find the pattern for the smallest possible depth change. Mid Row Fertilizer Depth Cam: A cam block in the holder on the mid row fertilizer units allow the depth of the openers to be set higher or lower in relation to the seeding depths. Rotating the cam to the different depth slots allows you to precisely control fertilizer depth. Packer Wheel Lateral Adjustment: Packer wheels can be adjusted to one of three positions in the axle tube. This one time adjustment can be made during first use to align the packer tires optimally with the seed furrow. Manifold Kits: Manifold kits on the 9800 drill accurately deliver seed and fertilizer to the seeding units. Single manifold kits allow for seed and fertilizer to be delivered to the seeding units. Dual manifold kits (shown) are used to place fertilizer separately to the mid row fertilizer units. Variable Spacing Manifold Lids: Seeding every other row or seeding row crops on 6/24 or 9/21 inch spacing can be accomplished simply by replacing the manifold lid. Unwanted rows are blocked out uniformly so that manifold accuracy is not affected. Row Blockage Monitoring: Optional blockage sensors are installed in the final runs to warn operator if lines are plugged or slow down significantly. One sensor per manifold for zone coverage or sensors for every run are available. * Weight with banders ** Weight without ground openers and disc levelers Power Requirements will vary based on air cart, openers, soil type and terrain.